5. 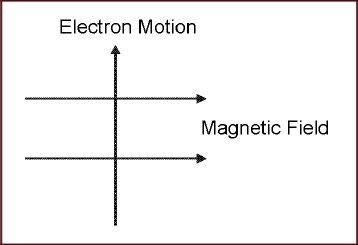 The motion of an electron in presence of a magnetic field is depicted in the figure. Answer (a). Maxwell's Corkscrew Rule: Imagine a right-handed corkscrew being driven in such a way that it moves in the direction of the current flow. The direction of rotation of the handle then gives the direction of the magnetic field lines. 8. Which one among the following hormones stimulates the plant cells to grow in a manner such that the plant appears to be bent towards light? 10. 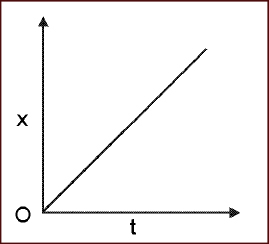 The motion of a particle is given by a straight line in the graph given above drawn with displacement (x) and time (t). Which one among the following statements is correct? 15. Which of the following statements is/are true? The angle of the axis in relation to the plane in which the earth revolves around the sun is not constant. The amount of energy given off by the sun changes with the transparency of the atmosphere. 18. Which of the following statements about sexual reproduction in flowering plants are correct? Stamen is present in the centre of a flower. Stamen produces pollen grains in the ovary. The swollen bottom part of carpel is the ovary. The fusion of germ cells gives rise to zygote. 20. Which one among the following statements about a healthy diet is correct? 31. Which one among the following countries was least affected by the tsunami that hit the Indonesian Ocean on 26th December 2004? Answer (b). Malaysia reported the least number of deaths among the given countries. 32. Which one among the following statements is not true about Bahadur Shah Jafar II? Answer (b). Bahadur Shah died in exile on in Rangoon (present day Yangon) in Myanmar. 33. Which one among the following statements is true about Lord Curzon?